Damen’s latest next generation tug has taken to the water. The new vessel, like the others in the series, powerfully blends proven technologies with innovation, providing a robust answer to the challenges of tomorrow. The ASD Tug 2813 is a compact vessel packaging greater sustainability, safety and reliability. The unveiling of the new series began last year with the RSD Tug 2513. The RSD, a revolutionary ‘always bow first’ tug, quickly demonstrated its credentials in a European tour. Starting in Malta before making calls in Italy, France, Spain, the United Kingdom, Belgium, the Netherlands, Germany and Denmark, the tug turned heads with its fresh approach to harbour towage. Like the RSD Tug 2513, the ASD Tug 2813 presents a range of well thought out safety measures. 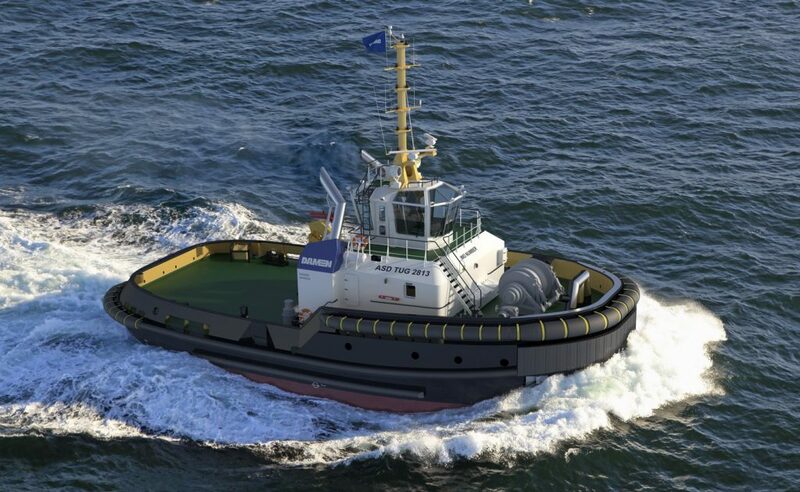 The tug is aimed at the below 30-metre harbour towage segment – a sector demanding increasingly compact and versatile vessels. At a glance, increased safety measures include large, tinted windows made of the shatterproof Damen Safety Glass. The windows offer uninterrupted, unrivalled views over the decks and to assisted vessels. The decks themselves are an exercise in spacious, uncluttered working. A high freeboard and shaped aft keeps things dry at all times, while the wheelhouse offers reduced noise and vibration. The ASD Tug 2813 might sport a host of innovative new features; the vessel though, is uncompromising in its stance when it comes to providing a reliable solution. Closed bulwarks, smooth welds and well-rounded curves all play their part in making the vessel not only easy maintenance, but also low maintenance. Aiming a vessel at the future requires detailed consideration of efficiency – not least in terms of environmental impact. The ASD Tug 2813 boasts an enviable array of efficient features designed to cut both costs and emissions to a minimum. Designed with the aid of TugSim – a computer programme developed by Damen and partners – the ASD Tug 2813 operates with optimal predictability. The compact nature of the hull considerably lowers fuel consumption at normal operating speeds. And, like all vessels in Damen’s next generation tug series, the vessel is prepared for IMO Tier III, which is becoming mandatory in more and more parts of the world. Damen has designed a Marine NOx Reduction System, which is easily installed even as a retrofit with no recourse to a conversion. With this system, urea is injected into the exhaust. The result is a reduction in NOx emissions significantly greater than the 80% required by the regulations. The ASD Tug 2813 offers not only a sustainable performance by today’s standards, but also by those of tomorrow. It’s ahead of the game. This brief description of the ASD Tug 2813 is just the tip of the iceberg. You can read all about it in more detail in the forthcoming Damen #7 magazine, out in May 2019.